BBC Radio 4's Taking a Stand profiles people who have taken risks and made sacrifices to stand up for what they believe in. Fergal Keane met Hong Kong-based tycoon Jimmy Lai to discuss his pro-democracy campaigning and criticism of the Chinese government. It's a part of the world where, quite often, the wealthier you are the closer you are to those in power. In China, and its special administrative region of Hong Kong, business tycoons don't make a habit of taking a stand for free speech and human rights. But there is one very loud exception. Having made a fortune from his clothing empire, Jimmy Lai could have taken the traditional route for a local tycoon: expanding his businesses in China and winning favoured status in the offices of the powerful. Instead he decided to confront China over human rights. Now as the owner of a highly profitable newspaper business based in Hong Kong and Taiwan he remains a sharp critic of the Communist Party. His political coming of age happened during the pro-democracy protests in Tiananmen Square in 1989. "I was very hopeful that China was going into political restructuring and I was very excited and I was very depressed and very hurt when they crashed into Tiananmen Square and killed those students. "I was in Hong Kong but I was watching the news, I was participating, I was paying money. I was very involved. It was a very emotional moment. From then on I said, look, I'm going to fight". Lai's response to Tiananmen was to level a notorious insult at the then Prime Minister, Li Peng, whom he described as a "turtle's egg" with zero IQ. Li was seen at the time as the architect of the crackdown. The reference to a turtle's egg has a particularly unpleasant resonance for Chinese people. "It's very insulting words for a Chinese to say but at that time I was 20 years younger - I was more impulsive then. "I don't regret what I did and what I said, but I paid a price for it," he recalls. He estimates that the resulting controversy cost him many millions in lost sales and business opportunities. It began with him having to close a factory and sell his majority stake in the clothing firm he founded. But China wanted him out completely. "We had shops in China, we already closed the factory and I already sold my share under 50%, so I thought I'm not the majority. "One day I was in Paris, the CEO then called me and said 'look Jimmy, ultimatum, you have to sell your stock in three days otherwise they will close all the shops'. "But if they close all the shops Giordano was dead because without China, as a public company we are dead. So I did nothing I said 'look, sell it' so I just authorised my CEO and in three days I was out." These days the Chinese government tends to ignore Jimmy Lai. He has been a beneficiary of the largely hands-off approach Beijing is taking towards Hong Kong. 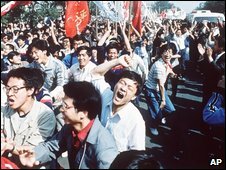 Although when China attempted to introduce strict security laws, Lai joined the many thousands who protested. China ultimately backed down. He is convinced democracy will eventually come to Hong Kong. "Yes, I'm sure. One day it will have to. China cannot be isolated with the world. If China has to trade with the world so closely, China has to be compatible. "But China cannot be compatible if it doesn't share the same value of the world, and the dominant value of the world is democracy." It doesn't involve any deep delving to discover what drives the pro-democracy passion of Jimmy Lai. As it happens he wasn't born in Hong Kong but only arrived there when he was 12 years old, smuggled on a boat from China. His family escaping Chairman Mao's Cultural Revolution. Lai worked in a local factory as a child labourer and worked his way gradually upwards until he established his clothing brand, Giordano. 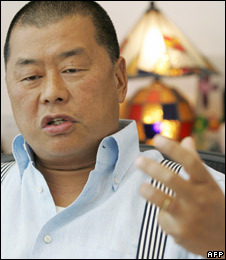 The then British-ruled colony of Hong Kong, the boisterous capital of Asian capitalism, made Jimmy Lai rich but also politically aware. "It's like a very heavy load has been laid from my heart. The moment you feel freedom, it's a high I never had again. "I came to this place when I was 12 with one dollar, and this place has made me what I am and the only way to pay back is just to do what is right: to pursue democracy. "I think it's something I should do to pay back to a society which has been so good to me." Lai has been criticised by those who feel that engagement rather than criticism is the way to deal with China. And not all of his business ventures have succeeded, for example an online shopping site failed with substantial losses. He also roused the ire of the Triad-organised crime gangs in Hong Kong and Taiwan when his newspapers started reporting on their activities. But Jimmy Lai is unrepentant. "I'm very happy because, you know, I'm rich enough. I need some meaning to live and fight. "You know, fighting for freedom, for democracy is a great thing for me to feel. I'm just 60, I still need a lot of meaning to live my life." 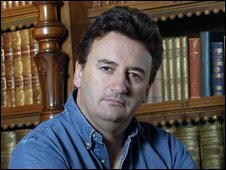 Fergal Keane's interview with Jimmy Lai will broadcast on BBC Radio 4's Taking a Stand on Tuesday, 27 January 2009 at 09.00 GMT. It will be repeated at 21.30 GMT on the same day, or you can listen to the programme on the BBC iPlayer.